storyU | Your story. Create it. Share it! Your story. Create it. Share it! Not knowing the answer is better. Beta: I dictated this on my walk this morning. Recently, I asked a room full of legislators if they can go back in time with me. I asked them to go back to high school and think about the following question: if you had access to the teachers addition of all of your content area books, how many of you would have gotten an A? Most of the hands went up. As a follow up, I asked them to flash forward to the late 80s, early 90s. I asked: if we were sitting together back then, and, I asked can you be successful if you can connect to any idea, any resource, and any person, at any time, and anywhere, would you be successful? Most raised their hands in affirmation. Here we are at a time and place in history where we can connect any idea, any person, and any resource, at anytime, and anywhere. What stops is now from being successful? The room felt uncomfortably quiet. I proposed a reason. I argued that the goal for schooling then and now still focuses on answering the question defined by others who already know the answers. How we demonstrate success is in one’s ability to show a command of answering those questions correctly in a timely matter. What is missing here is the power of essential questioning. We forgot, along the way, to teach people to ask better questions. So, who cares if we can connect anywhere, anytime, with any idea, any resource, and with anybody if we don’t know what questions to ask. Knowing the answer does not have the same value add that it once did. Now, the ability to ask a better, more essential question, is the key to unlock the potential of what tomorrow needs to look like. I saw an interview with David Bowie in 1993 where he talks about his excitement towards the Internet and what it means to people who want to change things — for good and bad. He said he’s excited about how anyone will be able to create anything and share it with anyone else at anytime and anywhere. He challenged the interviewer to think about that. The interviewer looked confused and even doubtful. David Bowie gleamed with excitement for the possibilities and what that really means to everything. David Bowie saw new opportunities to new questions. Even though were 15, scratch that, 16 years into the 21st-century, can you think about the power we can generate if we teach people to ask better questions? The opportunity has never been greater then it is today, the day after the death of David Bowie, to hear his words, absorb them deeply, and figure out ways to leverage this connectivity to make things better. Thanks to Mark Nichols and Rosa for their brains. Along time ago when I was studying how to manage change and efficiency while working for a city councilmember and later trying to rethink what an effective learning space needs to look like, I read a lot about system thinking and managing systems of change. Back then, I was intrigued with the model that Toyota had been incorporating from and evolved thinking models they used to help make the production and problem management process clearer for all involved. As the company got bigger, as more artists were brought into projects, the questions poured into management: how can we clarify the systems in order to prevent the tyranny of ambiguity? Ambiguity creates a lot of people issues. People issues are expensive in every way. As a storyteller, it’s super important to pre-visualize and visualize the ideas and the thinking. Clarifying the product (the WHAT), clarifying the process (the HOW), is the project. The project is simply not the final product, consequently, its the sum of the product and process components. Making sure this is visually clear, making sure the language is synced up with the team helps create a better story, thus, limiting ambiguity. The essential question for Toyota as it learned from the cultural failures of American manufacturing was: how can we be more empowered and effective AS A TEAM? For me, this is a great question, too, since I still see a lot of “us vs them” situations today in schools. I noticed that we consistantly try to change the stuff around people without actually making the WHY clear, clarifying the system and empowering them to change the stuff for themselves. Clear goals provide parameters; unclear goals require procedures (step-by-step). Parameters allow a certain level of ownership with the tasks. Procedures only give you the option to do it right or wrong. So, the teams limited to ask “just tell me what to do, how to do it, and when it’s do— very disempowering. Back then, as a new educator, I wanted to engage my colleagues in these types of conversations, however, because it was not a content area lead conversation, I was not very successful. Empowerment, motivation, purpose was not the star of our sentences, meetings, reports, and grades. Sadly, I still find a HUGE focus when we meet as a team on content and curriculum (stuff) and not on systems (way of thinking through things) that can help inspire, clarify, model, and support change. Yesterday, I saw a cool story about an organization that helped rebuild homes in New Orleans after Katrina that received some strategy (systems thinking) support from a couple of Toyota systems thinking managers to help them be more effective and efficient. They coached them on how to visualize the goal so everyone is clear. They clarified language into simple categories. They assisted them in publicizing their challenges daily. They encouraged people to contribute to the solution finding with the clarified and agreed-upon language. They helped make needs and concerns have an appropriate stage for action and reflection without doing “the blame game thing”. Consequently, this humanitarian organization became 50% more effective and less than a year. They were able to get more people back into their homes more efficiently because they had a system in place that helped create clear goals, clarify specific roles, and have a reflective process that was being utilized as a tool for assessing and adjusting. This mapping out process became part of the culture. Below, is an excerpt from a medical journal blog written by Richard Zarbo, also, used this thinking process to help make them more effective and efficient. Below each paragraph, I’ll ask reflective questions for you to think about or consider. QUESTION: How does your school, classroom reveal, in a safe and comfortable way, what is not working as expected? Do you have evidence of this? QUESTION: How do you visualize a process for your teams to share their victories, their lessons learned, and their needs and concerns regularly? QUESTION: how are you or your team aware of problems, possible problems? How are they addressed? What does that process look like? Is it transparent to the team? QUESTION: reflection. How many times has a problem gotten worse because we failed to address it and talk about it? How many times did we avoid talking about it because we were too scared of hurting someone’s feelings? The even bigger questions here are that what happens when we continue to not be clear with the goal(s), when we don’t have a clarified and common language on how we plan, how we produce, and how we reflect to assess, adjust, and re-evaluate? What happens when we don’t help make it clear, when we don’t visualize the process? Can we continue to assume we can make change and manage it if we only address the stuff like content and curriculum only? What happens when we don’t talk about how to think things through and what that looks like? Talk about it. Share the ideas with your teams. Call me a dreamer. It sometimes is perceived as a good thing but it’s also considered a tough thing to some. I know. Others, in my past and now, have told me that dreaming can be uncomfortable. It’s scary NOT to be in control. I know it. For me– I love the “what-if” attitude about it. I love to discover, be surprised, and also the safety of familiarity along the way. It helps me connect with the relevance of the why, it inspires me to see and feel the meaningfulness of the possibilities, and it gives me fuel to see the value of the applicability of it. Dreaming helps me see beyond the obvious. That’s why I joined Digital Promise. I want to help you make and tell that story! This Lego commercial is my manifesto right now. As you all roll out, you’re really rolling out your own new possibilities. It’s more than handing a tablet that is connected to the Internet to a student. It’s a portal to options and possibilities. Is it scary? Yes! Is it worth it, YES! is it the right thing to do, HECK YEAH! This is a beautiful and scary time for the system of education. It’s scary if the adults feel they can manage and control it all. It’s beautiful if it shifts the control and ownership of the learning experience with the students and their families. This is what you’re all doing– you’re including students and their families into this new story of what learning needs to look like from now on. Watch, listen, and experience this Lego commercial. I love what it says. Can you see this as your story that you want to tell? Are you learning and helping others to FIGURE IT OUT? If so, do you have evidence of what this looks like now? Do you have pieces of it? If you don’t, what questions should you be asking so that you can generate the necessary evidence to show the world this new face of learning at your school? Be inspired. Inspire others. Clarify where needed. Model every chance you get. Help others grow. Share that experience! The last line of this Lego commercial says: “I’m about to make something that will make you proud.” This is so important. Pause and think about this sentence. Be the change! Do Epic stuff! Dream. Select the necessary questions, resources, and people to help you with new ideas or enhance the ones you have now. Connect with other dreamers! Reflect on your victories along the way. Please share your lessons learned through the process. Make sure your needs and concerns are heard so that others can help turn them into a lesson learned and ultimately into more victories for you. This will get you and your school the narrative needed to be the change and do epic stuff. If we don’t, the traditional system will continue to miss opportunities for many of our children and the traditional system will continue to limit how we measure a wonderful learning experience. Stories matter! Lessons from a chef. Inspiration on the power of story. 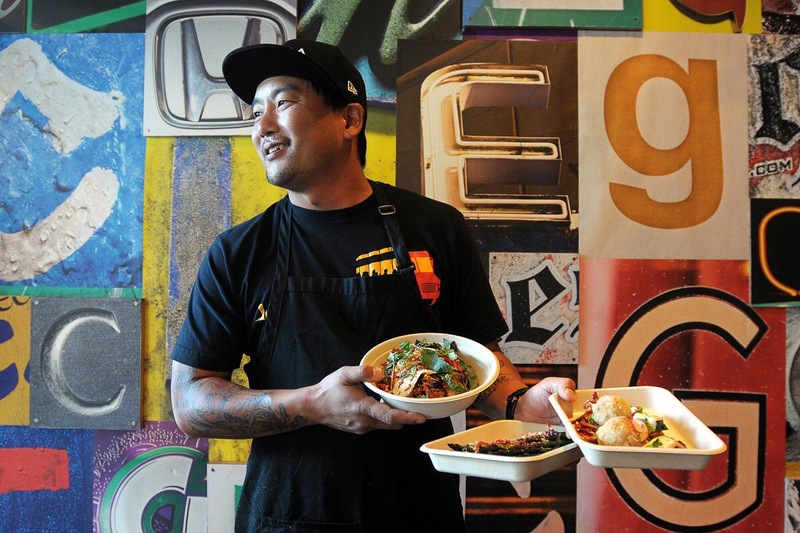 In a recent interview I saw online, chef Roy Choi talked about the art of making great food. This is my take away lesson form his chat! If you like the meal, great! But, the process of making it is magical. As you make it, you’re thinking about the chemistry: how do these ingredients work with each other. You need to think about the math and the balance needed to make it work. There is obviously a science to the techniques from how to cut something, to holding a pan, to working the environment into your dish. There’s a beauty in the activity and movement to the process, too, it’s like a dance when you watch an amazing cook or chef. However, it’s the story in the end that you infuse into the bowl or plate that differentiates you. This is the part that can only be measured by the experience, how one interacts with it, and how one responds to it. People forget that the secret ingredient is love. Sometimes, a chef peaks through the kitchen window out to the patron who is about to eat that very special dish you just poured your heart and soul into and you wait to see if your emotional contribution translates. It’s a lot deeper than buying an ingredient, cutting it, preparing it, cooking it, and serving it. That’s easy and measurable. The other part isn’t, the part that matters to me. Think about it. Connect your own dots! Why do we need communities more than ever? Why do communities matter? What does a community do? For me, they help me take risks because I know I can go to them for help, inspiration, ideas, and even instruction. Communities help me create, they helped me learn, and they help me share. Since I have a variety of hobbies, I am constantly connecting with people all over the world. As a learning chef, I religiously follow a variety of blogs and have a collection of bookmarks that I can go to for help. I subscribed to a variety of channels that I can go to for ideas and how to’s. I follow key chefs on Twitter and follow them using Facebook as well. I need to be connected with them. In my quest to improve my potential for being a smart and creative chef requires it. However, it doesn’t stop there. I follow a similar structure for my love of bicycling, skateboarding, drawing, photography, filmmaking, and even parenthood. Because I contribute to these communities, people are more willing to connect with me. This makes me feel safe, comfortable, and it helps me build the necessary confidence to take risks. What do your communities look like? Education should not be as complicated as it is. It is a structure created to provide students the necessary skill sets to learn to lead, solve interesting problems, and learn to tell the stories of the experiences along the way and afterwards. Unfortunately, politics, adult issues, school reputations, etc. provide the clutter and noise that blurs the personal intention of our education. Because of this, many new moving and complicated parts are thrown into our algorithm to get students from point A to point Z in the most efficient, effective, and empowered way possible. Because of this, we need to not feel alone. We need a community to help us rethink things, get inspired regularly, if not daily, look at ideas or share your own, and learn how to survive daily with strategies, tips, techniques that can help us get through the day or the lesson. What are your needs? What are the questions you need asked or answered to help you feel safe, comfortable, and confident enough to take risks today, tomorrow, and so on? Who can you talk to about this? Are your colleagues limited to the people around them? Maybe, you have more colleagues everywhere who can provide the necessary perspective to help you boost confidence. Communities do this. They create a sense of belonging. This is a human need that education today needs more than ever. Students, too, need to see and learn from the teachers on how they leverage people and resources throughout the world to help meet and immediate and/or long-term need. 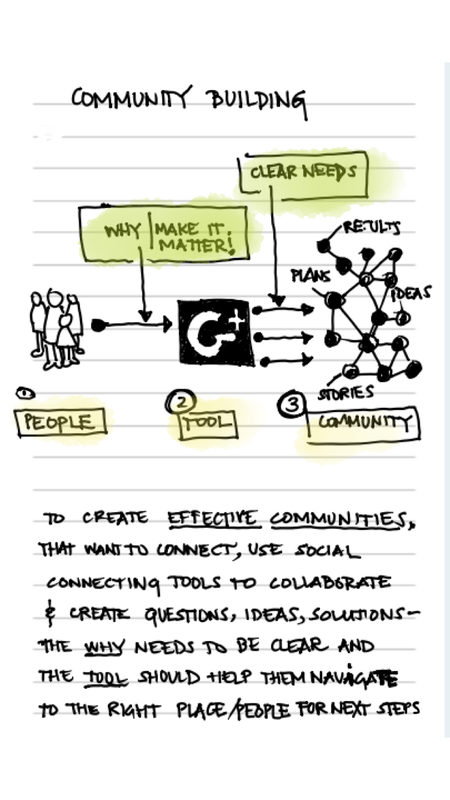 As we sell the idea to engage people in our schools to connect with each other and share ideas, we need to think about our essential question here: are we asking them to connect to their selected community using social tools we created for them? Or, are we helping them understand that they are not alone, that there needs and concerns and ideas are similar to people beyond the school property? And, because of this already existing environment of empathy and our digital promise schools ecosystem, how can they leverage tools to help them navigate their needs to the right resource, person, idea? What is the need we need to organize around? What is the goal for this group? Why should they connect with each other? How can we help facilitate these connections? How can these groups help reduce the clutter and shift the noise into signals that mean something as opposed to be seen as more work? How can we make the Digital Promise community even more effective, efficient, and empowered? How can we be the modem that helps connect the necessary nodes of your needs, wants, concerns, victories, lessons? Think through your communities. Why do they work for you? What do they need in order for them to better work for you? Please share! Making measuring matter to more people. How do you measure? How do you make measuring more effective? How doe we use what we measure guide our adjustments? These are a great questions we need to be asking more. We talk a lot about data but it seams like that’s it. We talk about it. What do we do with it? More importantly– what are we measuring? How are we measuring? Why are we measuring? After we measure, what happens with this information? After listening to a number of back-to-school events and seeing charts about how the school scores, how the different ethnicities score, how special need student score, and how language learners score on their standardized tests, not one talked with us about where exactly are the problem areas. What were the areas they found success? What were the patterns in the data? It was only a delivery if information. Why can’t this be a 2 way conversation? After the data is shared, what that mean to all of us and how can we help? These are the numbers. These are the numbers compared to…. These are the patterns that show the areas where they scored well and these are the areas where they didn’t. From these patterns, we are making the following adjustments. I wish there was a challenge for all of the other content area teachers to think through 1-3 strategies they can contribute to support a growth plan for those problem areas. It would be great for them to share those ideas to the other teachers and even the families. Maybe we can look at the strength areas and see how they can be used to support the areas in need for improvement. For parents, schools can make recommendations on what can be done at home to supplement the adjustment strategies. This is a challenge for us to think through a process to take results, reflect on them, identify patterns, identify strategies to make necessary adjustments. This way, I believe, we can make measuring matter more for everyone and make the journey more inclusive. Lesson learned: curiosity is our best friend, storytellers! What I love about quotes is knowing the back story. It adds so much more to the impact. So, why would one of the smartest minds say something like this. A few years back, the chief education scientist for CERN AND the ATLAS Hadron Collider project in Switzerland, told me in an interview that American schools should focus on making kids love science and help them see beyond the obvious. When I asked how, he responded that science fiction is key to get kids to ask WHAT IF questions. Once the WHAT IF is clear– the process to use imagination, inquiry, and experimentation means more. More science isn’t The option. Getting children to love science is. Curiosity + Love + Connection + Possibilities = the WHY to dream! Back to Einstein’s quote. The power of a fairy tale is rooted, grounded on curiosity, on making possible the impossible, on love, on imagination, and on hope. WHAT IF is the fuel to the place that lives in ONCE UPON A TIME…. We got to space because of dreaming. We were driven to fight for our civil rights because of a dream. We need dreams to move us, inspire us, push us, provoke us, get us new ideas– create new dreams. A Black matter scientist told me this!!! Make it matter. Make curiosity win for you. The stories will remind you why you do this. If you can sit with Albert Einstein today and have a coffee, tea, or even beer with him, I bet he’d tell you that fairy tales are not about the RIGHT ANSWER, but about new questions, new possibilities. Challenge: Make it matter more!